Kaltmeier, Olaf, ed. Transnational Americas: Envisioning Inter-American Area Studies in Globalization Processes. 2013. The Americas are shaped by a multitude of reciprocal dynamics which have extensive, conflictive and at times contradictory consequences for society, culture, and politics. These processes are embedded within a history of interdependence and mutual observation between North and South, which originates in the conquest and simultaneous “invention” of America by European colonial powers and which extends into the recent processes of integration. The latter encompass diverse phenomena such as migration, political integration, cross-cultural production and translocal identity formations. 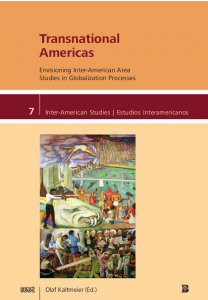 This book focuses on the border-crossing dynamics of globalization processes and seeks to conceive of an inter-American space of entanglements as a new perspective in area studies. With 16 essays divided into four sections—“Inter-American Geopolitics,” “Migration, Diaspora, Translocal Communities,” “Globalization of Indigenous Identities,” and “Post-multicultural Identity Politics”—this volume seeks to contribute to a transnational understanding of the Americas.